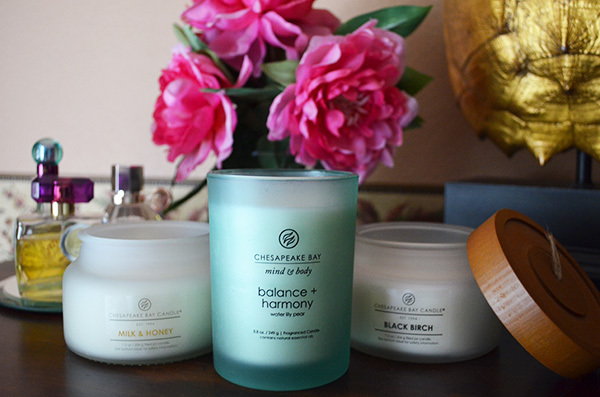 One of my favorite things to do after a long day of work is relaxing with scented candles, so when Chesapeake Bay Candle contacted me about their new candle collections, I was really excited to give them a try. When I received the candles from Chesapeake Bay Candle I was immediately impressed by the high quality packaging. The candles have a luxury feel to them with beautiful wood tops and heavy glass jars, some of which had a nice frosted glass appearance. Most importantly, I found their candles to have a strong fragrance “throw”, which is essential to a great candle. Chesapeake Bay Candle also has a lovely (and broad) selection of nature-inspired candle scents, which are sure to please the most discerning candle lover. I was definitely impressed. When you get a new candle, cut your candle wick down to 1/4 inch before burning to ensure even burning. Also, allowing your candle to burn at least 3 hours the first time you light it will also ensure that the surface of the candle melts evenly and doesn’t tunnel. Try enjoying a lit candle during your bath or shower time. The steam will enhance your candle’s scent creating an aromatherapy experience. 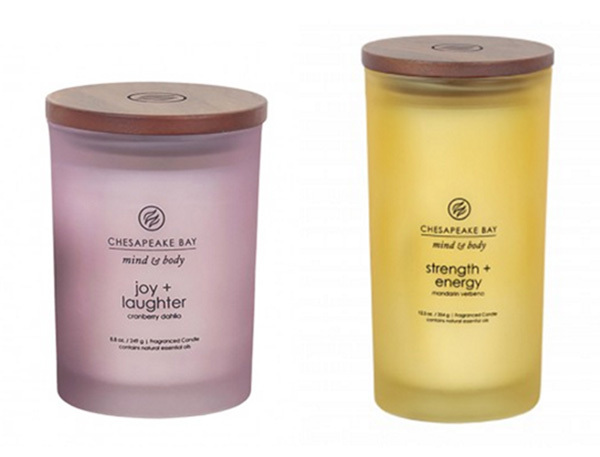 Chesapeake Bay Candle’s “Mind & Body” Collection. Select candle scents to accommodate your various moods and needs. 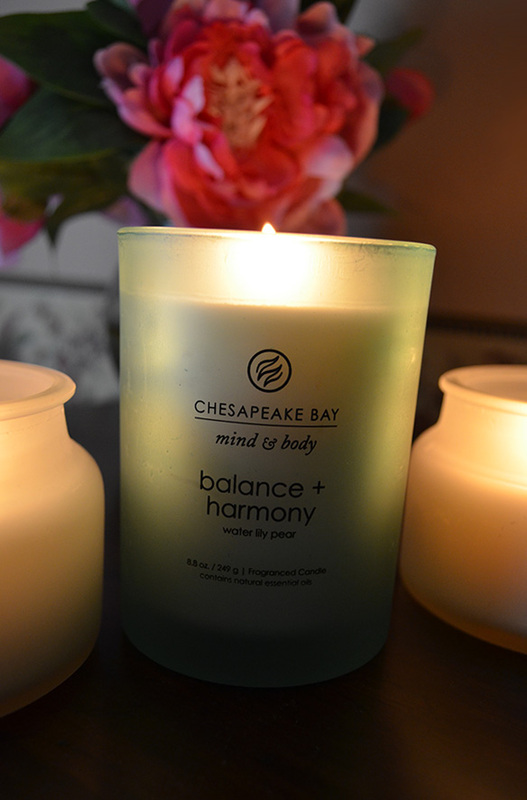 Chesapeake Bay Candle Co. has a great Mind & Body Collection with this specific idea in mind. I really enjoyed their “Balance + Harmony” candle. They also have energizing candles like the “Strength + Energy” candle shown above. Once you finish burning your entire candle, save your candle jars for unique DIY projects. You can find a few DIY ideas for your candle jars here and here. And if you need help removing left over wax from your jars first, here is a tutorial on cleaning out your candle jars. 5. You don’t have to settle for non-scented candles around the dinner table. 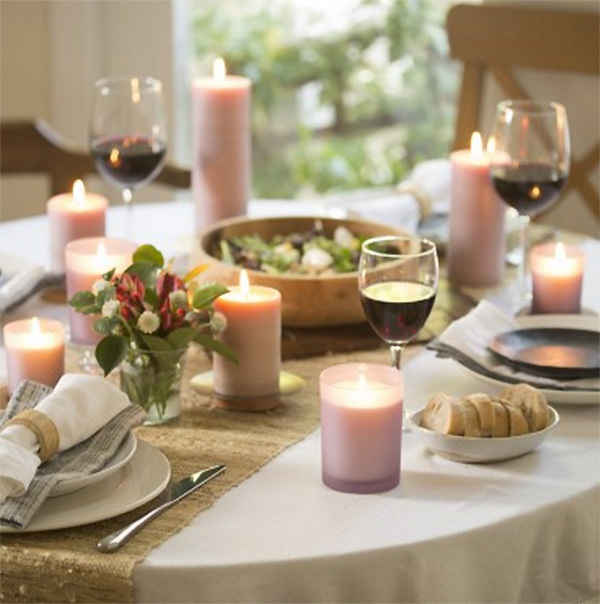 While dining, including scented candles with soft natural fragrances will add to a luxurious dining experience. Try a fragrance like Chesapeake Bay Candle’s Vanilla Blossom. 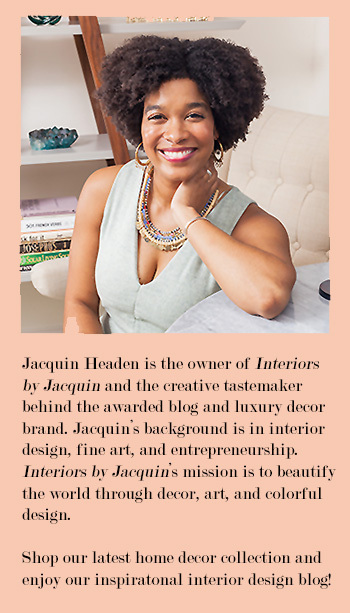 Enjoy dining at home with scented candles. At home currently I’m relaxing with these 3 amazing candles from Chesapeake Bay Candle, which I highly recommend (see above). I selected the Black Birch scent, Balance + Harmony, and lastly Milk & Honey, which was my favorite, although they are all fantastic. After close review I can honestly say that Chesapeake Bay Candle makes an excellent quality product from their packaging to the ingredients. To try one of their luxury candle scents, head over to the Chesapeake Bay Candle website to select the perfect candle for you!